Next week is July 4th and it is my very favorite holiday. I love the weather and all the fun that comes along with this time of year. Getting together with family and friends is got to be the best. I was in California a few weeks ago, and I discovered a new recipe that I promised myself I would do when I got back home because I just loved it. It was so good that I had to have seconds. Before we get to the that though, I want to start with a Tri-tip Roast. This cut of meat is just scrumptious and so easy to prepare. The Tri-tip roast is a cut of beef from the bottom sirloin and when grilled to perfection in my opinion is better than a ribeye. It is so tender and flavorful and it will soon become one of your favorites. It is extremely popular out on the West Coast and has finally made its way here to the Midwest. Here is how easy it is to do. I seasoned the roast with Four Brothers Prime Rib Seasoning. I use this seasoning for everything. I preheated the grill to 500-550 degrees because I wanted a very hot grill and then placed the roast on it. I seared the roast on each side by heating for 3 minutes and then turning it over for another 3 minutes. By searing your meat, it holds all the flavor in. Then I turned down the grill and made sure the roast was on indirect heat. I slowly cooked it to 140 degrees for Medium Rare. I took it off the grill and covered it loosely with aluminum foil for about 10 minutes so that the juices soaked back into the meat to give it that wonderful flavor. While the roast was cooking, I decided to have a cocktail to enjoy and found a recipe at a local restaurant that was so good I knew I needed to have this along with my meal. 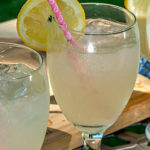 It’s called Lynchburg Lemonade and it’s sure to be a summertime favorite! Ok, back to when I was in California! This is what I’ve been waiting to share with you! I got the opportunity to try Mexican Street Corn and I have never been so excited about corn on the cob! I have always loved corn-on-the-cob but this took it to a whole new level. 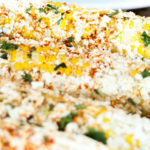 If you love corn you will love this experience. This recipe is unbelievable and I couldn’t stop eating it. You’ll be making this all summer long too! I think I just planned my July 4th meal and in fact I know I did! Enjoy the holiday with family and friends along with all the great foods of Summer. I wish you all a very happy 4th of July!